Crafty Garden Mom: Woven Ribbons: UFO Finish!! I think this may be one of my oldest UFO finishes to date! 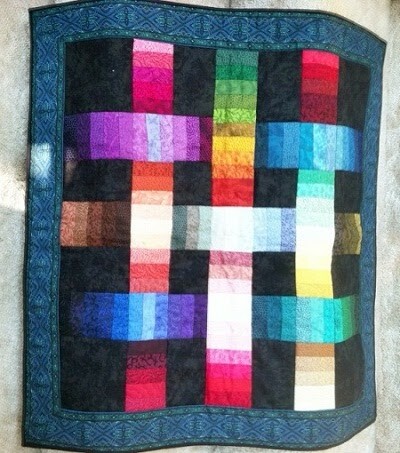 I started this quilt from a kit I bought at the Jinny Beyer Studio years ago (10+). You know what's funny about seeing quilts you made 10+ years ago? You realize how far you've come along. Those are some mighty wobbly pieced rectangles, LOL. In any case, I love the gradations, and it's a nice pop of color to my family room table as a large topper. I have added this to the UFO Along Flickr group. Come check out all of the fabulous finishes members are getting done! Every finished UFO counts as an entry all year long, with monthly prizes like books, gift cards, and fabric being given away. June's prize is a $15 gift certificate to Jimmy Beans Wool. Get your UFO's out and finish a few this month, then be sure to add a photo to the group! 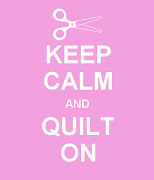 Tanesha, it is a lovely quilt. Good on you for getting UFO's done! 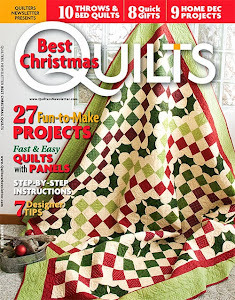 That quilt looks gorgeous! And I know what you mean about seeing your mistakes in older work. I felt that way while finishing my 4 year old UFO last year! I loved this quilt last time you posted a picture about it, but now it's finished and it looks even better! Hope you're enjoying your summer! Lovely finish! It's awesome to get projects from the UFO pile to "finished", isn't it? Well done!